Rare is the occasion when I actually let my iPod’s battery to get down so low that it dies while I’m listening to it. However, those rare times that it happens are horrible. I’m usually on a long flight or stuck somewhere for a while with nothing to do. It’s during these times that I would to just about anything for a backup battery. 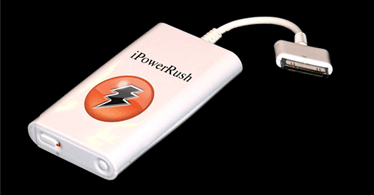 Which is why the iPowerRush would come in handy for any iPod or iPhone user. This nice little external battery runs off of 6 AAA batteries, so you’ll probably want to stock up on some rechargeables. Depending on which iPod you have, you can expect between 10 and 15 hours of additional life. Your iPhone will get around four hours of talk time, three hours of internet usage or 120 hours on standby. Since the device runs on simple AAA batteries, it keeps the cost down. You’ll only have to fork over $30 to keep your tunes playing in a pinch. I’ll give a try with this little external battery runs off of 6 AAA batteries…sounds interesting….